For more than 15 years, St. John Vianney Theological Seminary has remained committed to its mission. Our Mission: Responding to the Lord’s command to go and make disciples of all nations and under the apostolic vigilance of the Archbishop of Denver, the mission of Saint John Vianney Theological Seminary is discernment of, and unified formation in, priestly identity marked by an intelligence of heart, with men called to proclaim Jesus Christ and build a civilization of love in persona Christi Capitis. Likewise this community forms deacons and lay faithful to live as holy men and women in the Church’s mission of the New Evangelization. Every day, you, our family of donors, make this possible. 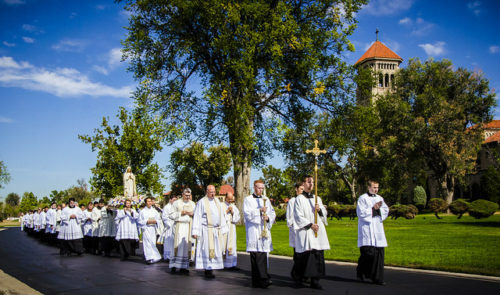 Your investment in St. John Vianney Theological Seminary empowers our men to become priests who positively impact parishes throughout the Archdiocese of Denver. Continue to pray for our seminarians. Thank you for your many gifts. Give in the Way That’s Right for You – There are many different ways to give to St. John Vianney Theological Seminary. Credit Card Payment: Gifts may be charged with MasterCard, Visa, American Express or Discover cards. Please call the Development Office number with any questions – 303.867.0614. Follow us on Facebook to keep informed about events.